Hinges have been in existence for thousands of years. Some of the earliest hinges date back to ancient civilizations, which used massive wood-and-stone hinge configurations to generate the movement of gigantic wooden doors. If we fast forward about 6,000 years to now- we have sci-fi types of hinges used by NASA and the military which can morph from their original shapes to an altered state, and back again, to meet the merciless demands of outer-space. Hinges are amazing devices that quite literally, keep the world moving- everything from refrigerator doors, to garden gates, to solar panels on satellites. Many hinges used for everyday purposes are made of aluminum or stainless steel. One might ask, what are the differences of one material over the other? Depending on the hinge application, each material possesses its own inherent advantages – something lacking with stainless steel hinges could be something aluminum hinges robustly provide, and vice versa. Stainless Steel hinges are composed of iron, chromium, nickel, manganese and copper, and are non-porous, with excellent corrosion and rust resistance- unlike regular steel hinges. Steel hinges are best suited for controlled environments where temperature and humidity are controlled. Stainless Steel’s added chromium forms an invisible corrosion-resistant film around the steel, making this type of hinge an ideal candidate for highly-corrosive environments. Many Stainless Steel hinges are used extensively within the foodservice industry in products such as food-processing equipment, commercial-grade refrigerators, etc. 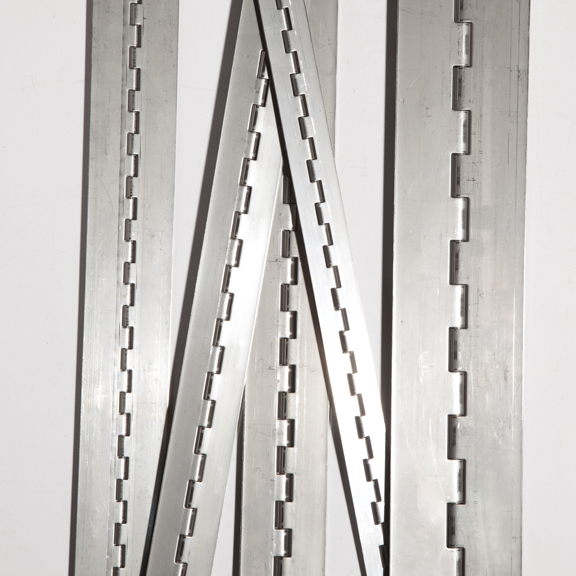 Compared to Aluminum hinges, the Stainless Steel variety are much stronger and have greater load-bearing capabilities. As far as thermal properties are concerned, Stainless Steel hinges can be used at much higher temperatures than Aluminum hinges. Case in point: Stainless Steel can withstand temperatures over 800 degrees Fahrenheit; While Aluminum can soften when exposed to temperatures above 400 degrees. For this reason, Stainless Steel hinges are embedded in fire-rated doors. Aluminum is more lightweight than other metals, but can be impressively strong, depending on the type of Aluminum. When blended with alloy elements, the strength factor can be enhanced. Aluminum possesses a high degree of thermal conductivity. When compared to Stainless Steel in terms of rust formation and corrosion, Aluminum is more susceptible to both. Interestingly, hinges made from Aluminum will have about one-third the weight of those made from Stainless Steel, which explains why Aluminum hinges are used in aircraft- to lighten the load! In fact, more than 75% of a plane’s load-free weight is comprised of Aluminum! Aluminum hinges are also used on boats and other seafaring vessels, and the auto and train industries utilize Aluminum hinges to improve fuel efficiency. Hinges are found in the smallest of items, such as the plastic lid of a TicTac box, to massive structures like elevated freeway and railroad viaducts. It is here where specialized hinges, actually eliminate the transfer of bending stresses that can occur during an earthquake. Regardless of whether a hinge is fabricated from Aluminum, Stainless Steel, or other- today’s world, agriculturally, aeronautically, architecturally, commercially, or militarily speaking, would not advance, nor exist as we know it, if hinges weren’t in place!